In the past, you had relatively few choices when it came time to choose your kitchen sink material. It came down to stainless steel or enameled iron. Your color choices were typically, white... or shiny stainless steel. Today, manufacturers are creating kitchen sinks out of a wide variety of materials. You have many different choices regarding colors, sizes, and styles. Your kitchen sink is much more than a simple utilitarian fixture. It can be a significant focal point in your kitchen as well as a functional part of the room. Here are some of the most popular materials for kitchen sink construction so you can make an informed decision about this essential element of your new kitchen! When considering materials for your kitchen sink you need first, to step back and define how you use it. Consider your family's practices and habits. Do you use your kitchen sink primarily for washing dishes, pots and pans, or do you just rinse and place them in the dishwasher? If your sink sees the heavy traffic, you may be best served by a more durable material like stainless steel or granite composite. Do you use heavy cookware? You might want to avoid materials like porcelain enamel. It can chip or scratch when subjected to heavyweight or force. Here is a side by side comparison of seven of the most popular materials for kitchen sink manufacturing. Stainless steel sinks are the choice of many homeowners thanks to their durability, longevity, and cost-effectiveness. Rated by gauge, most are between 16 and 22-gauge. The lower the number, the thicker and higher the quality. Consider choosing a sink that is 18-gauge or lower as the quality is much better despite the slightly higher price point. Stainless sinks require regular cleaning to maintain their look. If you have hard water, they can show spots, and they can scratch when abrasive materials or cleansers are used. They are hard to stain, but can if not regularly wiped. They are among the most popular choice for homeowners, and they look great in any style kitchen. This cobalt blue porcelain-enameled cast iron sink by Kohler matches the colorful tile backsplash and eclectic hand-painted walls. Enameled cast-iron has been a kitchen staple for decades for a good reason. Another durable material, they feature a glossy finish and are available in a wide range of colors. Porcelain enamel requires a degree of care, maintenance, and cleaning to avoid etching, staining, and scratching. Abrasive cleansers can scratch the surface, and strong acids can cause etching. They can also be chipped, and once that happens, if the cast iron is exposed, they can rust. This can be a concern with heavier cookware and family members who are prone to throwing things into the sink. Similar looking to porcelain-enamel, fireclay sinks are made of clay and minerals and then fired at extreme temperatures. Like cast iron, fireclay can chip with enough weight or force, but it does not run the risk of rusting. It is also not recommended for use with a garbage disposal as it is prone to cracking or crazing due to the vibrations. If a garbage disposal is a must, consider an alternative material. Made of fiberglass, plastic, and resin, acrylic is a cost-effective and attractive material. It comes in a variety of colors and designs. Being lightweight, it is great for any countertop material and a good option for retrofits. Because they are composed of a solid material, moderate scratches can be sanded and polished out, and they are resistant to staining. The primary benefit of acrylic is their resilience – you will not be breaking many dishes in an acrylic sink because they “give” a little when something is dropped. Their main drawback is their general intolerance to heat, although some manufacturers have adequately addressed this issue. 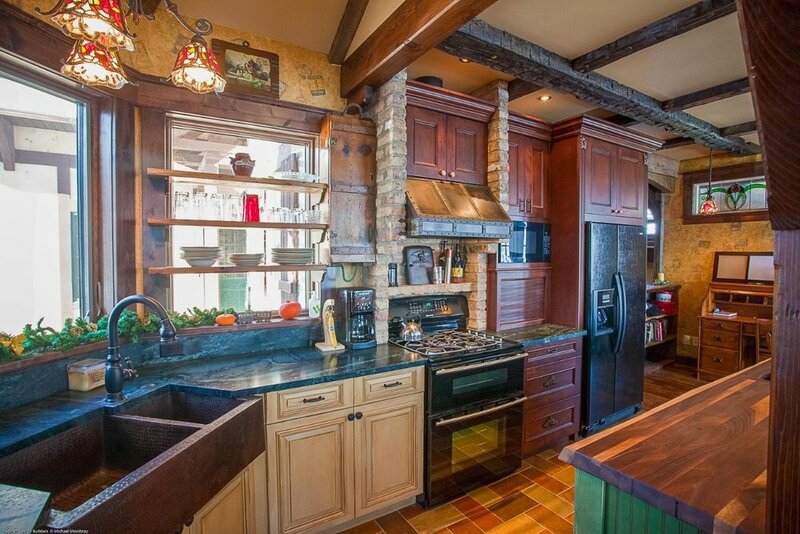 A hammered copper kitchen sink was installed in this one-of-a-kind storybook lake house kitchen. One of the more expensive choices, copper sinks are incredibly beautiful and beneficial for the kitchen. Copper will not rust, and it exhibits antimicrobial properties. While manufacturers must register with the EPA to guarantee this anti-microbial distinction, studies have shown that bacteria cannot survive more than a few hours on a copper surface. Copper is also highly reactive and will develop a distinctive blue/green patina over time. Those who wish can keep their sink polished, which will keep it looking new, but at the cost of its anti-microbial properties. A non-porous alternative to stone a solid surface sink is made of resin and minerals. 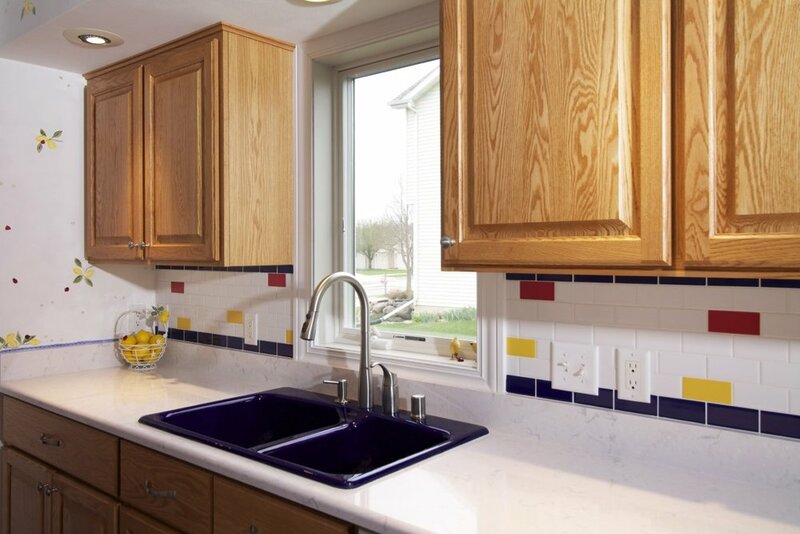 Used for countertops, sinks, and tubs, a solid surface material is versatile, durable and repairable. Like acrylic, scratches can be sanded and polished out. Because of their composition, even chips are not a concern. They are easy to clean, although metal scouring pads are off limits due to scratching. Solid surface sinks are also relatively resilient and can withstand temperatures up to 450 degrees making them a worry-free option for your kitchen sink. A Blanco Silgranit sink was used in this remodel, to complement the black in the stone countertop. Stone sinks are a luxurious and attractive option. There are several different types available including 100% marble, 100% granite, granite composite (85% quartz granite 15% resin) and cultured marble (marble dust, stone, and resin). These sinks are relatively heavy and as a result, may require special cabinet preparation for safe installation. 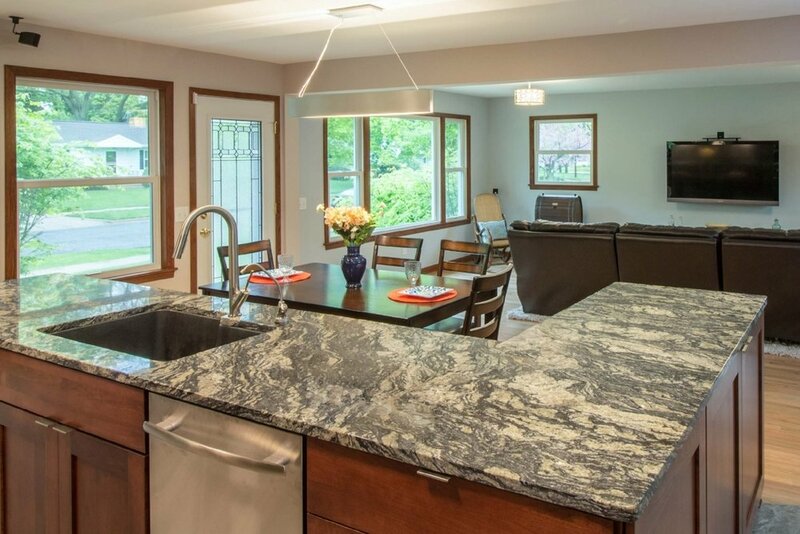 Solid granite and marble sinks are often found as “apron-front” or Farmhouse style sinks. They can have a distinctive chiseled face showcasing the natural stone, or sport intricately carved designs. If you are seeking an elegant look, a smooth front surface matching the sink's interior is always a great option. Solid marble or granite sinks can be expensive, but granite composite can offer a similar look at a much more cost-effective price. Your design-build-remodeler or interior designer can go over the specific options for your kitchen remodel with you. The bottom line is that your sink can go from being a utilitarian fixture in your kitchen to a focal point in your design with the right material. Always keep your personal needs and preferences in mind when shopping for your new kitchen sink. With a little research, and the right design team there to help you out, you will find the perfect material to fit your lifestyle and aesthetic needs! 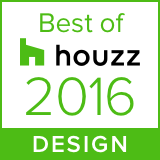 Want to see more kitchen designs and sink options? Click here!